Last summer I ran a private event, a foraging walk for a swanky south London cocktail bar, an excitable bunch, brimming with ideas and eager to explore and utilise some of the cities wild flavours in their drinks. It was a roasting hot day and many of the plants we encountered were very dried out, still useful in many ways but not looking there best. After we parted company it occurred to me that this was an excellent opportunity to forage for a few ingredients for my “dry store”. Like everyone else, I use a selection of spices to cook with, exotic flavours like chilli and cumin and aromatic herbs like basil and thyme. Unlike most people though, my dried spice rack contains numerous native wild plants and seeds, dried mushrooms and seaweeds, many of which are almost unheard of in contemporary cooking, ingredients like clove root, pepper dulse, staghorn sumac, water pepper, crow garlic, alexanders, sweet woodruff, hogweed, peppery bolete and hoary mustard. I could add another fifty to this ever expanding list which allows me to constantly experiment with wild foods, all year round, not just when specific things are in season. Despite its wealthy, well groomed location, Clapham Common has some lovely wild patches, so armed with some plastic resealable bags, I was able to collect enough wild marjoram to last me for the rest of the year, as well as some alexander seeds to use as a pepper substitute, aromatic hogweed seeds for baking and flavouring drinks, some spearmint and some wild plums that were too tasty to even make it home. The strong sunshine and the heady smells of these lovely native spices, put me in mind of my last trip to India, punctuated by long train journeys and cups of sweet spicy chai. 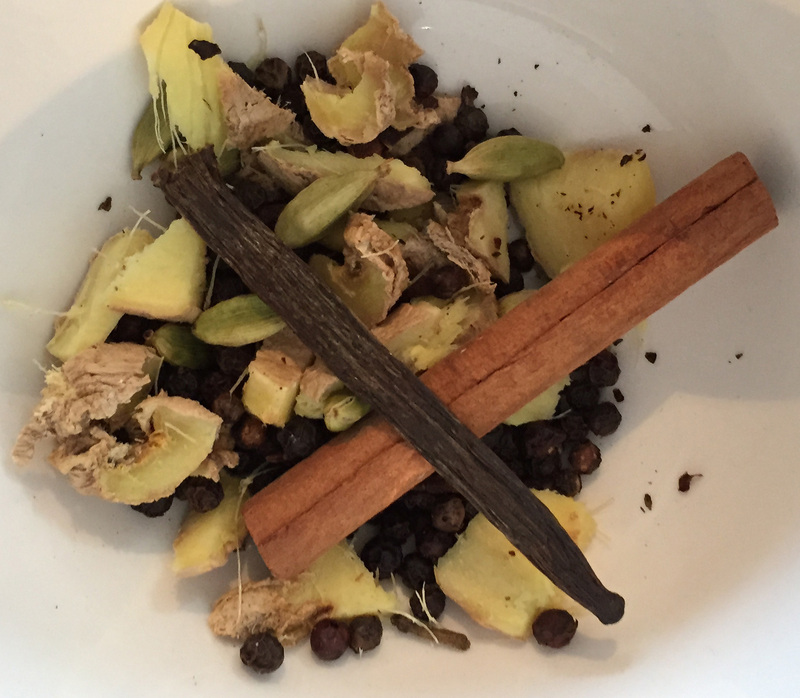 With the enthusiasm for flavour shown by my would be wild cocktail makers, I wondered if I could make a native wild chai and headed home to raid my spice cupboard and get experimenting. I am always fascinated to explore our local equivalents to some of the world’s more exotic spices and this is what lead me last year, to creating a 21 ingredient, native jerk seasoning for chicken or fish, but that as they say, is another story, and a very long one too. 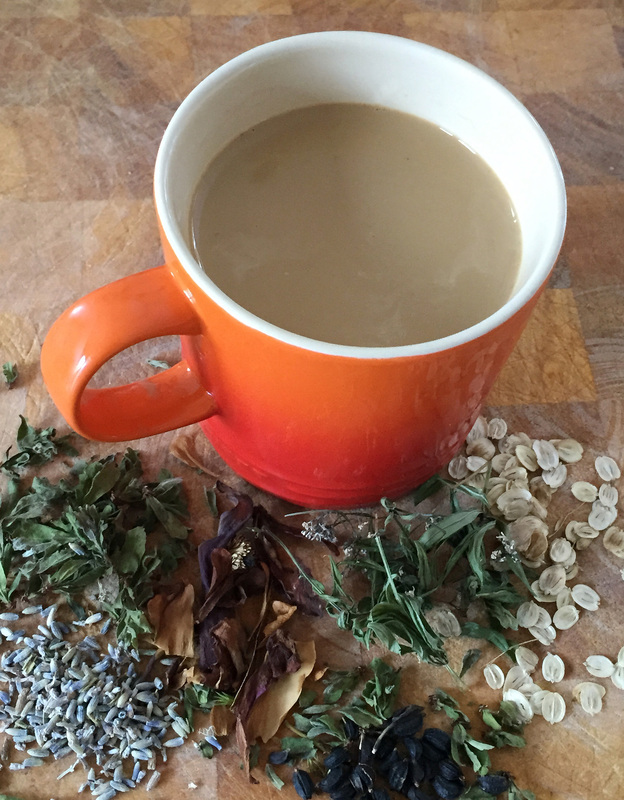 For my wild chai, I started by making a conventional version, partly to see if mine came up to scratch and also to help me create a comparable drink. For the traditional blend, I used half a pint of water and added a 2 inch cube of ginger root (sliced), 2 tsp of black pepper corns, 12 cloves, 8 cardamom pods and a 2 inch length of both vanilla pod and cinnamon stick, then brought it to the boil and simmered for 5 minutes. Then I added half a pint of whole milk, 2 tsp of black tea and 2 tsp of honey and simmered gently for another 5 minutes. Perfect, India in a teacup. 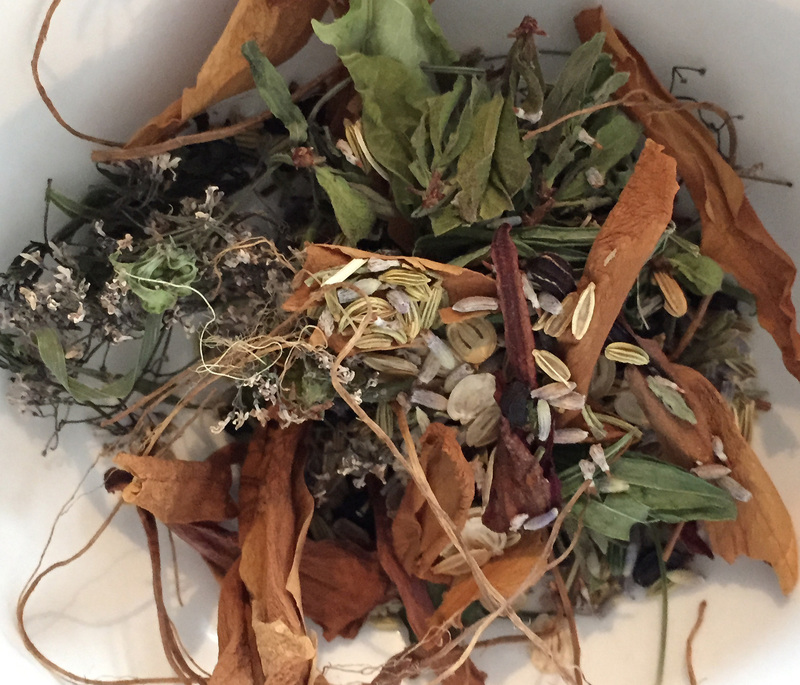 Now for my creation, and I should stress, you don’t need every one of these foraged plants, in fact you could make a normal chai and substitute one or two ingredients or just experiment with whatever you have…masala means a mix, so mix it up, play and see what you come up with. Instead of ginger I used a dozen dried magnolia petals which have a strong chicory meets ginger taste to them and instead of black pepper I substituted alexander seeds using only 1 tsp; they are so much stronger than pepper and have a bitter back taste. The cinnamon stick was replaced with a tsp of hogweed seeds and the cloves with half a dozen strands of wood avens (aka clove root), which has a taste like a mix of clove and nutmeg. For the vanilla I used a wonderfully aromatic plant called sweet woodruff, adding approximately 2 tbsp of its dried leaves and flowers. The honey, milk and water remained the same but instead of black tea I plumped for 2 tsp of roasted and ground dandelion root, from which I often make an excellent caffeine free coffee. All that remained was the tricky task of mimicking the complexities of cardamom; initially thinking I’d use bay leaf and juniper berries, I finally settled on a heaped tsp each of lavender flowers, fennel seeds and the unusual and aromatic little heath land plant, bog myrtle. How did my chai compare to the original version? At the risk of blowing my own trumpet, I completely nailed it, first go! The only real difference was that my chai tasted a little more bitter, to be expected with wild plants and easily corrected with the addition of some extra honey. Awesome, I love chai after an Indian trip so will be trying a native version as well. Wow, really inspiring And creative idea! Thank You for sharing! Previous post: My Mushroom Manifesto.